I'm officially waving the white flag on summer - at least when it comes to outfit posts. Time to transition to fall. September is usually a beautiful, warm month in Seattle - however, they are predicting rain for Labor Day weekend. Yikes! This is a perfect time to find some great sales on summer clothes for next year. I picked up both of these pieces at Old Navy for $5.49 each. That's practically free! I love polka dots, and I will be able to wear this shirt into fall with a light jacket. 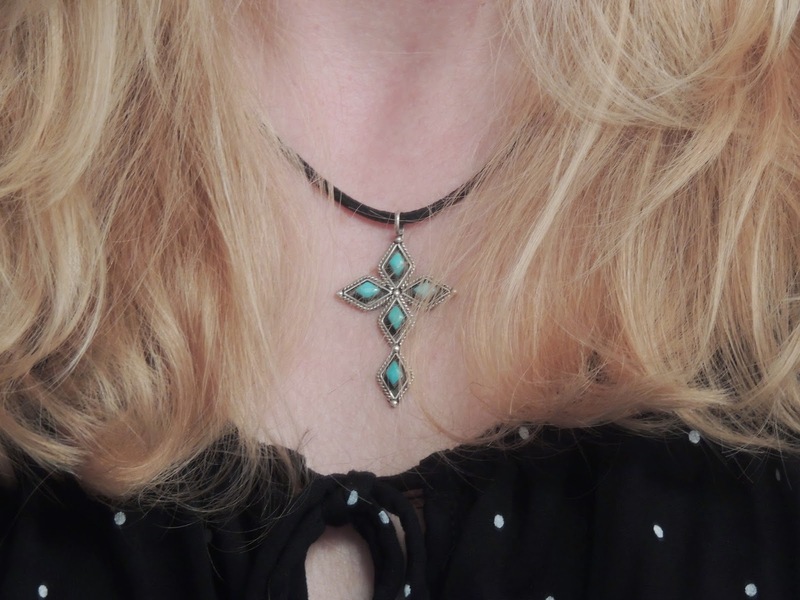 The outfit seemed a little dark though, so I added this pretty turquoise necklace that my mom bought me in Arizona. Thanks Marie. Love Old Navy! Love the necklace! the whole outfit is adorable! Thank you - I love the necklace too! Wow! Great deal on this cute outfit! 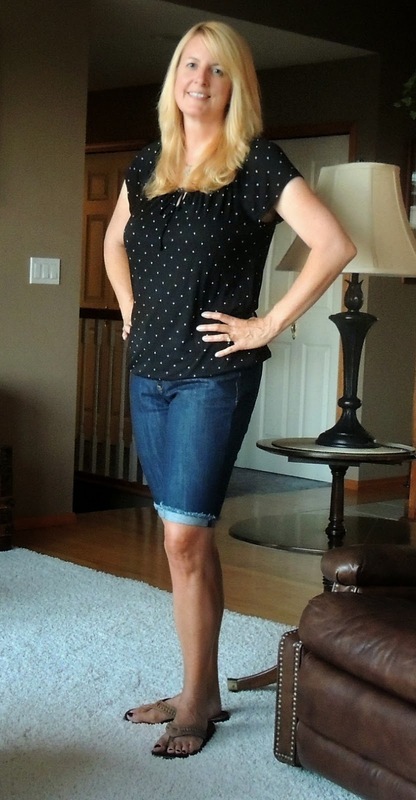 Love the polka dot top! Polka dots and great deals are my favorite! I have a hard time transitioning with the seasons. I'm not sure if it is because I will miss the actual season - or I have just gotten in a fashion rut! I love your outfit and your necklace - and I hope the weatherman is wrong! Thanks Susan. I'm usually ready tor the next season's clothes, even if I'm not happy about the weather. Fall is always my favorite time of year. I always look forward to sweaters, sweatshirts and boots. I'm ready for some cooler weather but with a forecast of 95 all week looks like it will be awhile in SC! I love to snuggle up in boots and sweaters too - if only it wouldn't rain so much here! What a cute outfit and a great buy! My kind of shopping Lana! I am also excited for fall's arrival eventhough living in Los Angeles who knows when that will be....this is a cute outfit to finish off your summer season. Fall is actually my favorite season, although I'm sad to see summer go this year. sooooo you'll be doing the fall challenge then, right?! I think I'm getting there too.. slowly. If I could wear sundresses year round I would be happy, but it doesn't seem to be in the cards! Thank you Sharon! They're really comfy too, and I like the longer length. Old Navy has the best sales! I've picked up so many great items this summer for both myself and my twin girls. Have a great day! Thank you! I love Old Navy - and probably shop there way too often! I love the turquoise cross and I'm quite partial to polka dots myself! What great finds! I love that length of shorts. It's hard to believe summer is over. :( It went far to quickly this year. Summer went so fast this year! I really like this length of shorts too - very comfy! I really hope summer isn't over. After the winter we had last year it needs to last at least until December to try to make up for its past errors. I agree completely! Seattle's summers USUALLY last until the end of September - keeping my fingers crossed for both of us! I have a similar shirt and I wear it all the time. Summer is far from over in Texas though! Yes, I bet it's still pretty warm in Texas. We have about a month left - and then we seem to jump straight to rain and cold!